Niagara Falls consists of American Falls, Bridal Veil Falls & Horseshoe Falls with Luna Island and Goat Island separating them. From Ontario side the best place to see all the three falls would be from Niagara promenade. We started our journey from Oakvile and reached the Niagara city parking lot close to I Max in less than an hour. The views are recorded from Skylon base, the bridge on top of road leading to Niagara promenade and from various locations on Promenade. Post lunch recordings are from Maid of the Mist ( Hornblower ) top deck. The other locations on Ontario side for tourists to see the Niagara Falls are from Skylon Tower, Casino Tower, Sheraton on the Falls and Skywheel. On American side portions of Niagara falls can be seen from Luna Island, Goat Island, Prospect Point Observation Tower and Cave of the winds. 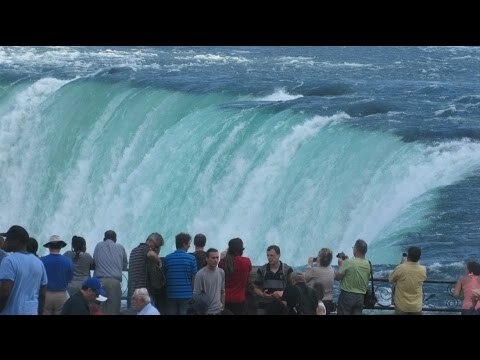 Tourists from both the countries can see all the three falls from close proximity is by taking the Maid of the Mist cruise ( actually it is called Hornblower Cruise from Canada side) through Niagara river which forms the boundary between Canada and USA. NO COLOR ENHANCEMENT HAS BEEN DONE FOR THIS VIDEO.